Meanwhile, over at the KMT, some of its heavyweights are jockeying for position for the party's presidential nomination. Today KMT Legislator Wang Jin-pyng made a public appearance at a temple in New Taipei, where he was greeted by well-wishers and supporters. His announcement of his candidacy is imminent, and he could be joined by former president Ma Ying-jeou and party chairman Wu Den-yih. As Wang makes his entrance at Guandu Temple, a bystander greets him as Mr. President. Wang smiles from ear to ear as he basks in his moment of popularity. It won’t be long now before he declares his candidacy for the KMT’s presidential nomination. The date has already been decided privately. The big reveal is coming. Wang is confident in his bid, but he’s not the only one who is. 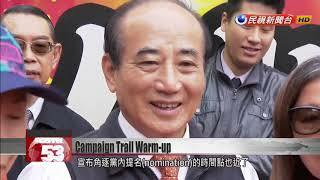 Over Spring Festival, former New Taipei mayor Chu released a video of himself avoiding a foul play and completing a standard hand in a round of mahjong. The move has been seen as a metaphor for him winning his party’s presidential nomination. But in the face of the challenge, Wang remains undaunted. It is best if nobody commits a foul. If one player has a standard hand, then you just have to compete against that player, right? Every player is different. Of course you have a different strategy for each one. I’m very sorry. I don’t play mahjong. I wish Eric Chu the best. Former president Ma and Wang both took to the streets of New Taipei today to hand out red envelopes. At Sanchong’s Yi Tien temple, Ma passed out envelopes for an hour and a half, but there was still a long line extending from the entrance. The crowd gave the former president a warm reception and expressed hopes for a re-election bid in 2020. After Spring Festival, political observers expect to see more of Ma and other KMT heavyweights as they race to court support for their presidential bids.